The International Energy Agency (IEA) released its World Energy Outlook 2017 in November, providing global energy market projections through 2040. [i] The outlook assumes that governments will stick to the pledges they made on energy, including India and China’s pledges to move away from fossil fuels and the United States’ to reduce its demand for oil through fuel economy improvements for cars and trucks. 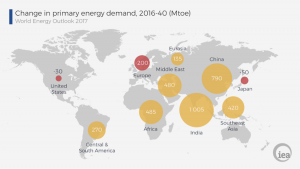 Despite the pledges, IEA predicts that global energy demand will increase by 30 percent by 2040, which is equivalent to adding another China and India to today’s global energy demand. [ii] It predicts that the global economy will grow at an annual average rate of 3.4 percent and that population will expand from 7.4 billion today to more than 9 billion in 2040. The largest contribution to demand growth—almost 30 percent—comes from India, whose share of global energy use increases to 11 percent by 2040, but below its 18 percent share in the expected global population. Southeast Asia’s energy demand is expected to grow at twice the pace of China, resulting in Asia accounting for two-thirds of global energy growth. The Middle East, Africa and Latin America account for the other one-third. The IEA sees four major shifts in the global energy system: the rapid deployment and falling costs of clean energy technologies, the growing electrification of energy, the shift to a more services-oriented economy and a cleaner energy mix in China and the resilience of shale gas and tight oil in the United States. As a result, the IEA believes that by the late 2020s, the United States will export more oil than it imports. The United States will still import heavy crude oil to support its refineries while exporting light oil. By 2025, increases in U.S. gas and oil production will turn the country into a net exporter of fossil fuels for the first time since 1948. Hydraulic fracturing technology has made the United States the undisputed leader of oil and gas production worldwide, [iv] transforming the United States from an energy importer into a major player in global markets capable of producing 30 million barrels of oil and gas equivalency per day by 2025, up from 24 million barrels per day today. IEA also predicts that the United States will become the world’s largest exporter of liquefied natural gas by the mid-2020s,[v] surpassing Qatar, and helping to supply a natural gas demand increase of 45 percent by 2040. The United States is expected to become a net natural gas exporter this year. Since 2000, world coal-fired power generating capacity has grown by nearly 900 gigawatts, but IEA expects net additions from today to 2040 to be half that amount—400 gigawatts—with many of these plants currently under construction. In India, IEA expects the share of coal in the power mix to drop from three-quarters in 2016 to less than half in 2040. In the absence of large-scale carbon capture and storage, IEA forecasts global coal consumption to be flat. IEA expects renewable sources of energy to meet 40 percent of the increase in primary demand and provide 40 percent of total power generation in 2040, capturing two-thirds of global investment in power plants. IEA assumes that policies continue to support renewable electricity worldwide, increasingly through competitive auctions rather than feed-in tariffs, and the transformation of the power sector is amplified by millions of households, communities and businesses investing directly in distributed solar photovoltaics (PV). China and India are expected to rapidly deploy solar PV, helping to make solar energy the largest source of low-carbon capacity by 2040. In the European Union (EU), renewable energy accounts for 80 percent of new capacity additions. Wind power in the EU will become the leading source of electricity soon after 2030, due to strong growth of onshore and offshore wind. According to IEA, growth in renewable energy is not confined to the power sector. IEA expects that the direct use of renewables to provide heat and mobility worldwide will double. In Brazil, IEA sees the share of direct and indirect renewable use in final energy consumption increasing from 39 percent today to 45 percent in 2040, compared with a worldwide increase from 9 percent today to 16 percent in 2040. China’s demand growth slowed markedly from an average of 8 percent annually from 2000 to 2012 to less than 2 percent per year since 2012. IEA expects it to slow to an average of 1 percent per year to 2040 in part due to energy efficiency regulation. By 2040, however, per-capita energy consumption in China is expected to exceed that of the European Union. Without new efficiency measures, China’s end-use consumption in 2040 would be 40 percent higher. In the IEA projections, China overtakes the United States as the largest oil consumer around 2030 and its net imports reach 13 million barrels per day in 2040. IEA sees the main driving force behind global oil growth, however, shifting to India post 2025 due to stringent fuel-efficiency measures for cars and trucks and a shift in car purchases to electric vehicles in China. China accounts for over 40 percent of global investment in electric vehicles, and has 25 percent of its market electric by 2040. IEA sees China accounting for a quarter of the projected increase in global gas demand with projected imports of 280 billion cubic meters in 2040, which is second only to those of the European Union. In electricity markets, IEA expects one-third of the world’s new wind power and solar PV to be constructed in China and China continues to lead a gradual increase in nuclear energy, overtaking the United States by 2030 to become the largest producer of nuclear-based electricity. Though still a major consumer of coal, China’s coal use peaked in 2013 and IEA expects it to decrease by almost 15 percent by 2040. IEA expects China’s carbon dioxide emissions to plateau by 2030 at a level slightly higher than today and then to start to decline. IEA believes China’s carbon dioxide emissions peaked in 2013. IEA sees the world’s energy system in transformation: China takes a back seat to India in energy growth, the United States becomes a major oil and gas producer and exporter and renewable energy continues to make major in-roads into energy markets driven by government policies.